NathanRising » The bigger the group, the better. For Nathan, anyway. The bigger the group, the better. For Nathan, anyway. 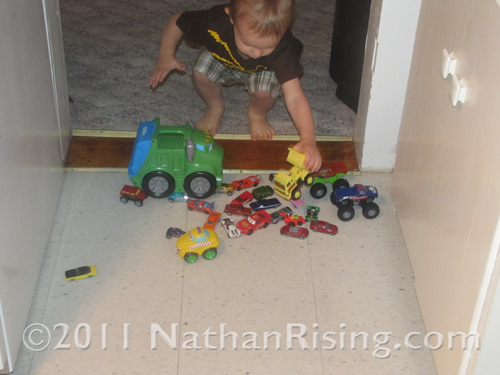 Nathan is in this phase where he LOVES to group all his toys together. Especially when said group happens to be somewhere rather inconvenient. Like in doorways. Because I have a bad habit of not watching where I’m going (I know, how can I do that with a toddler in the house? ), I end up stepping on Hot Wheels and giant Legos… and let me tell you, stepping on that stuff barefoot HURTS! Regardless of the mishaps, though, it’s still super cute that he does this. This entry was posted by Jen on September 8, 2011 at 11:02 am, and is filed under Daily Life. Follow any responses to this post through RSS 2.0.You can skip to the end and leave a response. Pinging is currently not allowed.